Nanny Poppinz policy is that there are NO, repeat NO, upfront fees or charges of any kind. You only owe the referral fee when you have selected a full or part Nanny or a commitment has been made for a temporary Nanny. There are 2 parts of paying for the Nanny: the first of which is the Nanny Poppinz referral fee and the second is the actual salary of the Nanny. The referral fee is paid to Nanny Poppinz and the salary is paid directly to the Nanny. Temporary Nannies are paid in cash. Please remember that Nanny Poppinz is open 24 hours per day and if you have hired a full or part time Nanny you also have Nanny Poppinz back up care which provides referral free replacement Nannies. All of the Nanny Poppinz services are customized to your specific requirements regardless of their complexity. A full time Nanny, either live in or live out, generally works more than 25+ hours per week. A part time Nanny works no more than 24 hours per week. A temporary Nanny works a minimum of 4 hours and can work up to 50 days. Corporate, Convention or Special Event Nannies are normally for the duration of the event and are cost at or as near to cost to Nanny Poppinz as is possible. Newborn Infant Specialists are more expensive. Costs are not additive, that is if you get a temporary Nanny weekly for a month and then decide on a part time Nanny the temporary referral fee cost made to date are deducted from the Part Time Referral Fee cost. Once you are a Nanny Poppinz client you are treated like one and there is never any double charging. 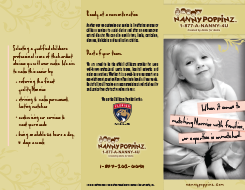 Nanny Poppinz also provides special referral fee discounts for Military and Law Enforcement families. ** Should the family stay in a hotel where parking must be paid, the family should cover this cost for the Nanny.